Portland's Mississippi Avenue is a hotbed of trendy eateries that serve up some of the city’s most delicious food and drinks. The area is also home to quirky boutiques, local brewing companies and other independent businesses that make it one of Portland's most popular destinations. You'll discover it all as you explore the artsy, historical neighborhood with a local guide, stopping at brick-and-mortar restaurants such as Mee Sen Thai Eatery and popular food carts like Koi Fusion. 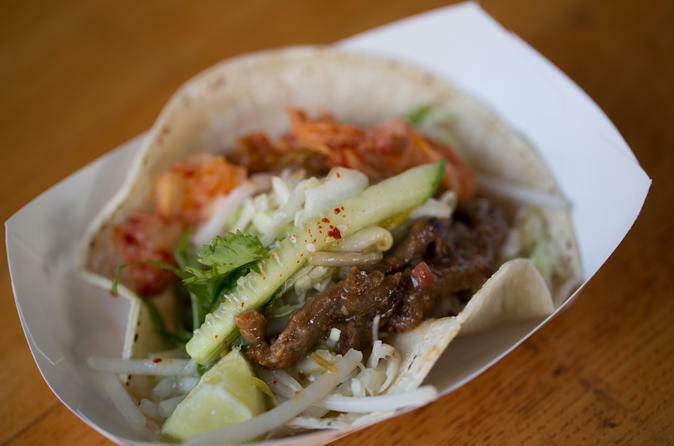 Sample everything from bulgogi beef tacos to ice cream sandwiches, accompanied by local beer, Willamette Valley wine and creative cocktails. Take a trip to the east side of Portland, out of the downtown urban core to discover the true heart of Portland. This tour is limited to 14 people, ensuring a small-group experience. Your food tour of Mississippi Avenue begins right in the bustling heart of the neighborhood, where you’ll meet your guide and enjoy your first tasting of the day, a yummy Thai glass-noodle salad, accompanied by homemade blueberry soda or a Willamette Valley Pinot Grigio. From there, continue your walking tour with your local guide, stopping at some of Portland’s most popular eateries and drinking establishments, all concentrated within a few blocks of each other on Mississippi Avenue. Exact itineraries vary slightly each day, but all tours are likely to include Mississippi Marketplace, where food carts gather into a “food cart pod”, The Meadow, a delightful shop dedicated to salt, and chocolate, along with one of Portland’s best breweries. In between stops, pass by shops and other sites that add to the neighborhood’s eclectic character, such as one of Portland’s famous Benson Bubbler water fountains and a light bulb shop where an episode of Portlandia was filmed. The tour ends around the corner from where it began. Take some time after the tour to browse the shops and maybe have another cocktail!